Your game room should be a place that reflects your taste and personality. 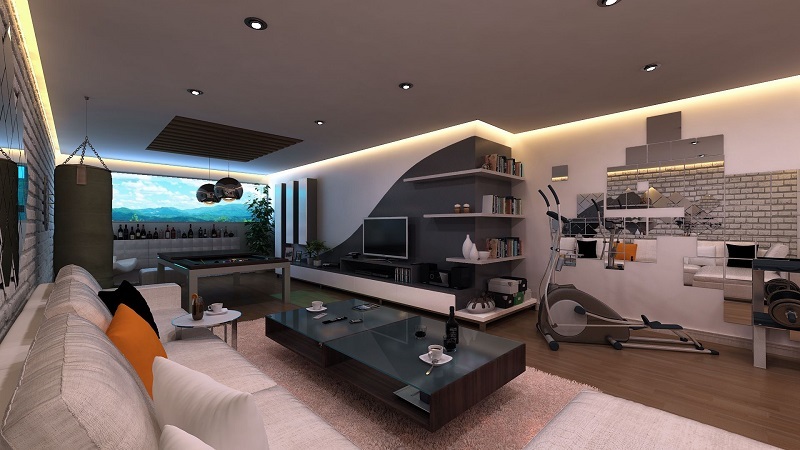 You should feel comfortable and enjoy spending time in your game room. As a result, you might decide that your game room could use a new paint job so that it can reach its full potential. If you have decided to paint your game room, consider these tips to make sure that you are happy with the final result. As is the case with most people’s game rooms, your game room is probably full of valuable electronics, furniture, and personal items. As such, the first step you should take before beginning your paint job is to remove any items that can be easily moved and cover everything else. Even if you are very cautious when painting, accidents can and likely will happen. By taking this precaution you can ensure that your valuables are protected from unnecessary damage. Primer is an incredibly useful tool that should be utilized whenever you repaint a room. The right primer can protect your paint job from damage and ensure that it lasts as long as possible. Additionally, if you are using a lighter color than the color of the current paint, primer can ensure that the original color doesn’t bleed through. If you need help picking the right primer for your situation, check out our article on what primer to use before painting. As it is incredibly important that you are sure of your color choice, you might consider patch testing a few colors to help you make up your mind. If you have it narrowed down to just a few colors, painting small sections of your wall in each color can help make your final decision much easier. This can help you understand how the different colors compliment your furniture and how they look when exposed to different lights.